Schlage announced its latest brand innovation ‘Schlage Control Smart Interconnected Locks’, based on ENGAGE Technology which provides multi-family property owners with highly scalable and secure capabilities with a greater appeal for residents. The nexTouch wireless access control solution for small businesses by Yale Locks & Hardware was selected as a 2016 ESX Innovation Award winner in the Electronic/Mechanical Locks category. Rising sense of security, ease of operating and comfort are some of the major factors that are estimated to drive the demand for smart door locks in upcoming years. 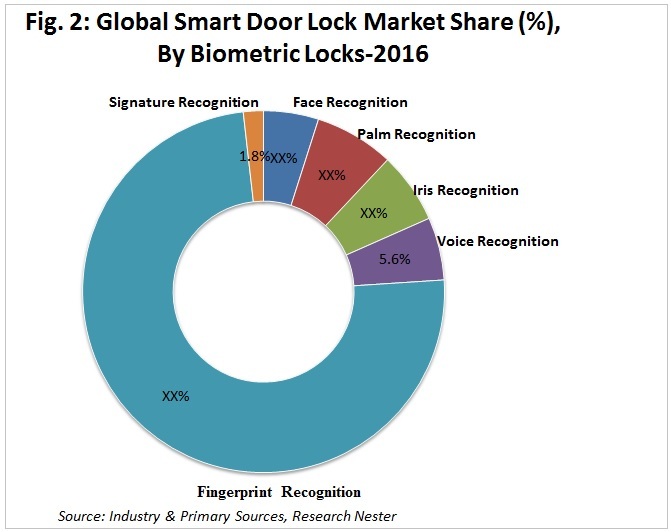 Further, the increasing demand for improved and advanced digital door locks operated by smart electronic gadgets is estimated to boost the global smart door lock market with noteworthy revenue of USD 4,606.60 Million in 2021 from USD 919.9 Million in 2015. In addition to that, financial losses suffered by victims due to burglaries, larceny thefts and motor vehicle thefts among others is estimated to boost the growth of the global smart door lock market with a CAGR of 30.80% over the period 2015-2021. 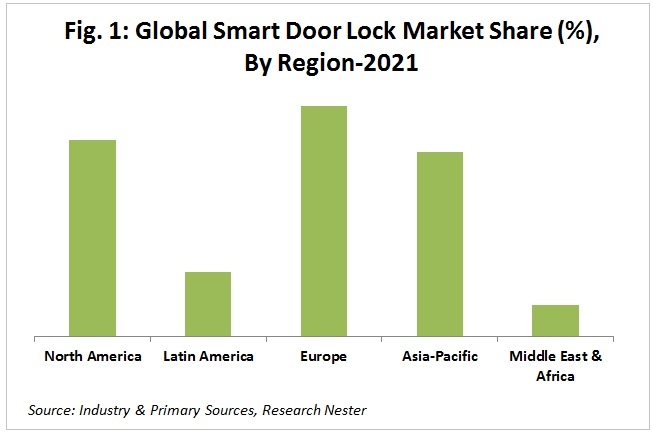 The global smart door lock market is segmented by regions into North America, Latin America, Europe, Asia-Pacific and Middle East and Africa, out of which, Europe held the top rank in the global smart door lock market during 2015 and is anticipated to hold its dominance by expanding at a compound annual growth rate (CAGR) of 27.30% over the forecast period. However, in terms of CAGR, Asia-Pacific is anticipated to be the most attractive market owing to the better GDP figures, promising trade balance, flourishing economies and continuous expansion in personal disposable income in the region especially in the merging nations such as India and China. In addition to that, India and China are currently witnessing a robust economic growth with rising personal disposable income combined with higher purchasing power of people which is anticipated to boost an increased spending on security. 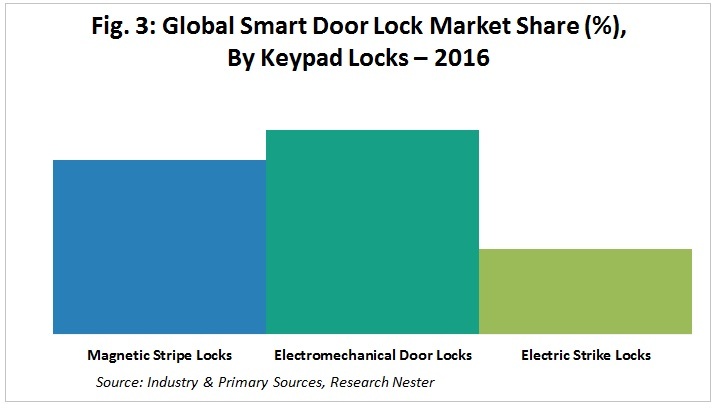 Further, North America smart door lock market holds the second highest share in the market, where the U.S. smart door lock market holds the dominating share in the region. This can be attributed to the positive growth of the real estate sector in the country. The global smart door lock market is divided by keypad smart door locks into magnetic stripe locks, electromechanical door locks and electric strike locks. Among these locks, the electromechanical door locks segment is anticipated to hold highest market size by the end of 2021 by expanding at a compound annual growth rate (CAGR) of 26.43% during the forecast period. Further, the magnetic stripe locks segment is anticipated to grow significantly in upcoming years. Besides, the flexible alignment, low current consumption, strength and durability are the key factors that will drive the demand for the electric strike door locks in upcoming years. The global smart door lock market is segmented by end-user into government, commercial, industrial and residential sector. Among these segments, the commercial sector is anticipated to project highest market share of around 34% in 2021 followed by residential sector. The growth in the residential segment is attributed to an increased use of keypad locks in the residential buildings. Further, increasing urbanization and rising rate of burglary crimes in residential facilities, the market is anticipated to project an increase of 200 BPS over the forecast period. Increasing crime rate around the globe is forcing consumers to move towards better security systems. Home monitoring cameras and smart door locks are among the most popular security devices. In the U.S., the burglary takes place approximately every 14 seconds and 56% of the break-ins are through the front or back doors. The financial losses suffered by the victims of these crimes are driving the growth the global smart door lock market with a remarkable growth rate. Further, the growth in the hospitality industry and a fierce competition in providing better services are believed to encourage more hotel owners to adopt the smart door lock technology, which in-turn is likely to propel the smart door lock market across the globe. Along with that, most of the emerging nations such as India and China are currently witnessing a robust economic growth with rising personal disposable income. With higher purchasing power, people in these nations are anticipated to spend more on security. Additionally, technological advancements are estimated to supplement the expansion of the global smart door locks market in the near future. Factors such as shorter lifespan of the batteries, less adaptability to change from conventional mechanical locks to digital locks, prone to being hacked, high cost for installation in both domestic and commercial buildings are expected to dampen the growth of the global smart door lock market in the near future. Some of the affluent industry leaders in the global smart door lock market are Panasonic Inc., August, Yale, Schlage, Samsung, Kwikset, Dessmann, Lockitron and SentriLock. Moreover, other key and niche players are working towards the expansion of product portfolio along with investing in high quality R&D to develop highly engineered and innovative technologies with easy interface for smart door locks in order to gain competitive edge in the global smart door lock market.